Based on our investigation, it appears like BackToFun.com dba Back to the Caribbean is a marketing company that sell vacation packages for Las Vegas, Florida and the Caribbean Islands including Aruba. They also attempt to sell you timeshare. The complaints against this outfit is that some of these vacation packages expired without further notice. When consumer notified RBF regarding expiration, they got no assistance in resolving this. We urge you to exercise care and caution. scamFRAUDalert see it appropriate to issue this ALERT as Houston Passport & Visa Specialists, LLC DBA usbirthcertificate.com have generated significant number of complaints as reported to the Better Business Bureau. The complaints vary from poor service, non delivery of product, no refund policy, over charging and not having a place of business address. RTechName: Cymitar Technology Group, Inc.
activities is a reseller of colocation services online and lying to customers about the services is not a matter of public concern. In essence Paul Sigelman is saying that the public has no rights to know about his client past business practices. 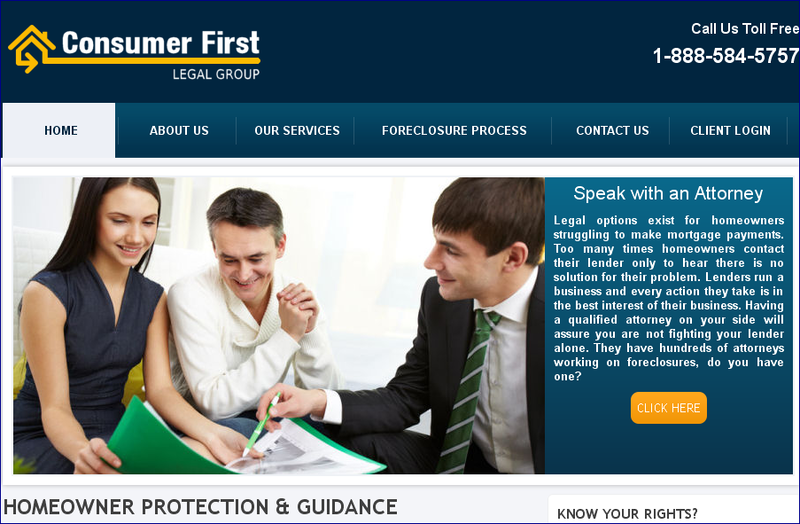 Consumer First Legal Group LLC aka THE MORTGAGE LAW GROUP continue to solicit Loan Modification from consumers and not delivering on their promises. THE MORTGAGE LAW GROUP appears to have been a network of Lawyers operating under the domain http://themortgagelwagroup.com/which now appears to be offline. 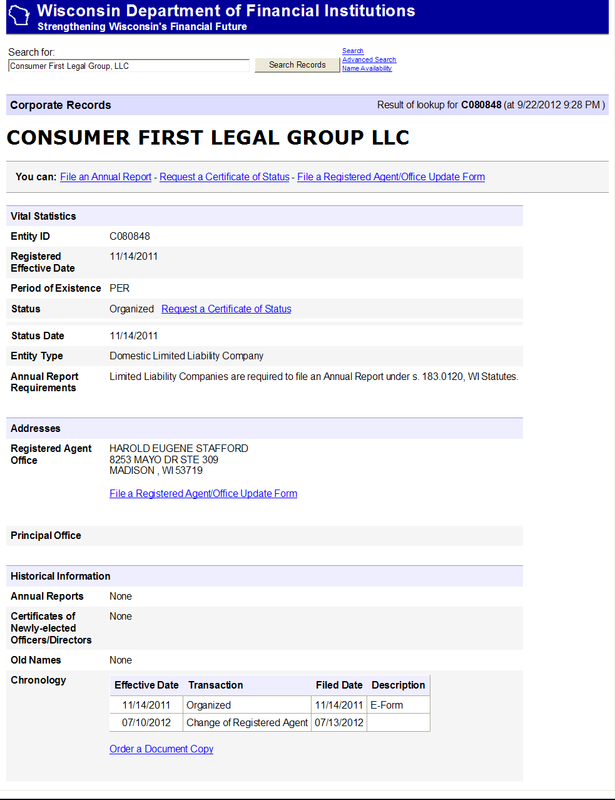 The Consumer First Legal Group LLC http://www.consumerfirstlegalgroup.com/ is registered to one Harold Stafford who is also been link to The Mortgage Law Group. Consumers have complaint that nsta PC Care failed to perform the repairs instead they have had their PC’s hijacked. Madam Its with immense pain and regret that I am writing this complaint letter to you. I am not even sure you are ever going to read it because in our country there is no system where a simple person (without pulls or jacks) can raise his or her voice against a wrong done and hope to be listened to. Anyways the complaint is regarding a policy that i had taken for my daughter in 2009. (details mentioned at the end) I was told by the representative of the bank Mr. Vipin(mob no……………….) that it was the best investment I could make for my child. The policy required me to make an bi-annual premium of Rs. 50000 (total Rs. 1 lac for one year).I was told that the policy could be surrendered after 3 years if i needed to do that and i was ensured that I would be getting more than what i had paid till then because there was no way that this policy would ever give me loss. He never told me where my money was being invested, what kind of market risks were involved etc which could even leave me with a loss.I was naive to trust him and went ahead with the policy as me and my whole family have our accounts in ICICI bank for the last more than 10 years.In fact our company has its major accounts with ICICI bank only. With that kin d of trust and faith, i put my hard earned money into the policy. Unfortunately after paying 3 installments, i was not able to pay the remainder installments. There were some personal problems and I did not have enough earning to pay the lumpsome amount.I requested the agent to help m e to break up the annual premium into monthly installments so that i could manage but he insisted that it could not be done. With absolutely no help from the bank, i finally decided to surrender the policy and get a refund. I went to the Sector 29 office of ICICI life insurance in July and inquired about the procedure to surrender and get a refund.I was very curtly told by the person sitting on the customer service desk that if I wanted my money back and surrender the policy, I would be required to pay another Rs. 1.5 lacs as part of the remainder premiums for one and a half year and then only I could get my money back after deductions which amounted to Rs. 30000. Unfortunately I met with an accident while driving a few days after that meeting and was advised bed rest by my doctor as i was in my eight month of pregnancy.I was helpless as I was personally required to go the bank to sign the surrender documents. I called the agent also and he assured me that there was no problem and i could go after i felt ok and i would be given my dues after the deductions. Now today i.e 24.08.2012, when i again went to the office at sector 29 to do the formalities, i was told that now the policy has been closed and all i would get back is Rs 36000 out of the Rs. 1.5 lacs that i have paid 3 years back. To my utter shock, the guys that were sitting there behaved like they were doing some kind of a heavenly gesture by even handing out this Rs. 36000.They also said that now I needed to pay Rs. 2.5 lacs more and leave it with the bank for another year before i could surrender the policy. When i refused to oblige and demanded that i wanted my money back, I was told to go complaint wherever i felt like. An elderly couple in their late 60’s was sitting next to me fighting over a similar issue where they or their daughter had made a loss of Rs. 4lacs after investing almost 20 lacs in the last 4 years with an ICICI policy. we are simple people and one and a half rupees means a lot to us. i have been out of work for m ore than a year now and my husband is a service class person.I am in my last stage of pregnancy and required this money to help me with the forthcoming expenses. If I could pay Rs. 2.5 lacs now, I don’t think i would require to surrender this policy in the first place.I feel cheated and duped and all of a sudden ICICI no longer sounds a trustworthy name to me.because it was not just me today at the bank. There were 3 customers who had similar complaints and were there to surrender their policies. I am pained beyond words and with immense grief in my heart, I request you to show some relief towards my case. All i am asking is a refund of Rs. 1.5 lacs that i have earlier deposited.i will bear the loss of Rs. 30000 as charges towards surrendering the policy considering that I am in urgent need of money. But there is no way i am a position to pay Rs 2.5 lacs for another year. I very humbly request you to consider this case sympathetically and help me.You would indeed be doing much to instill faith and trust of a generation in our system which is marred by corruption and in justice in all fields. It is with immense hope that i am writing this letter to you. I am sure that you will be sympathetic to my case and set an example by doing justice.regards, Anupam Joon. policy no. 11280649, Smartkid, New Unit linked plan.